It was a beautiful night at the old ball game! 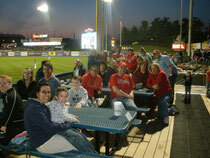 About 20 folks from Daybreak gathered at the Reading Fightin Phils and enjoyed a wonderful time of fun and fellowship around the picnic tables in the outfield. Aidan Hakes threw out the first pitch! The all-you-can-eat buffet of BBQ chicken, burgers, hot dogs, potato salad, fruit cups, fries, etc... was delicious! The kids splashed away in the heated outfield swimming pool. The many mascots entertained us during the baseball game. The evening ended with a spectacular fireworks show! It was a fun time with our Daybreak friends!